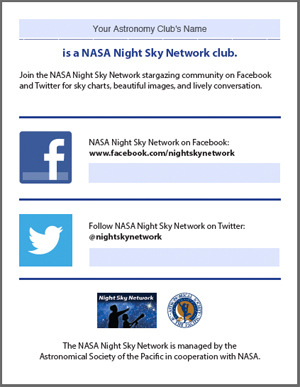 Pass this flyer out at events so your visitors can keep up with what's going on in the night (and day) sky. It's great for clubs who don't have social media, and if your club does have social media, you can add your information to the flyer. There are form fields for Club name, Facebook, and Twitter. Clubs will be able to save the edited pdfs. Please use Adobe Reader - preferably the latest version.